One week you're pedaling across a highway in Arizona, admiring the red rocks and wide expanses. The next week you're riding along the familiar Lakefront Path before transitioning to downtown Chicago on roads you've driven plenty of times but never thought to pedal. And maybe the week after that you're riding through the lush forests of the Pacific Northwest. You're sweating, your legs are burning, you're leaning hard into those turns on the roads, you know you're going to wake up sore from head to toe tomorrow--but you haven't left River North. In fact, you haven't taken a foot outside 108 W. Hubbard, home to Real Ryder Revolution, or more affectionately shortened to R3, so you don't have to stumble over a tongue twister every time you say you're going for a bike ride. I used to love Spinning. I'd go three, four, sometimes even five times a week, often pushing the running aside to hit the bike. I could practice climbs that I couldn't find within 30 minutes of home, headwinds that I really wouldn't want to get stuck in outside, and speed sets that could make me a reckless rider. But then Spinning got old. The songs were the same, the workouts rarely varied from routine intervals, and the classes dragged on. And on. And on. If you've ever tried to exercise when your heart's not really in it, you know it's about as enjoyable as a trip to the doctor's office. Just when Spinning got stale, and I retreated to trainer rides in the living room, I discovered a new way to enjoy it. Except it wasn't Spinning, it was Ryding, my label for the 45-minute cycling session at R3. And Ryding--with its jumbo TV screen that could project anything from a desolate desert road to the busiest urban streets or a favorite movie to a collection of music videos that match the day's playlist, ceiling lights that dim purple to make white clothing glow, and unique RealRyder bikes--refreshed that indoor cycling experience. RealRyder took that stationary indoor cycling bike, which had been designed to replicate a road bike, and kicked it up a notch by doing the unthinkable with a still object: make it move. 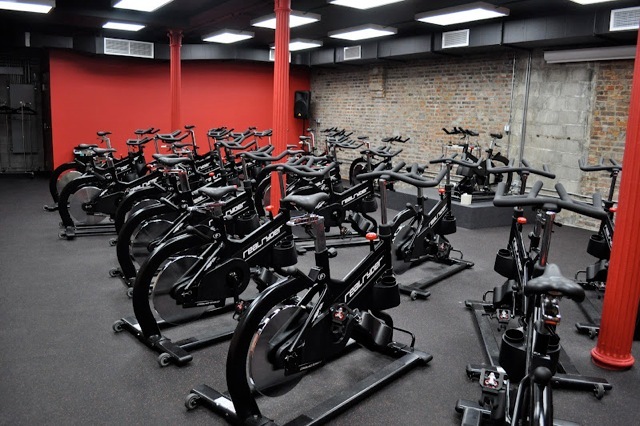 RealRyder bikes lean from side-to-side, forcing you to work your core and strengthen your upper body from your arms to your lats while pedaling with your legs and balancing atop the bike. Put all of those together and you're looking at a greater calorie burn and less boredom on the bike. Class sure flies by when you have to think about banking and pulsing with your arms (easier said than done, but that means I'll be back to work on that upper body strength)--and you can tune out to the music and whatever is playing on screen. By the time Friday's lunchtime UrbanRyde was up, I was ready for another 45 minutes of ryding. But my legs, which had been pedaling steadily even when my arms failed at matching the instructor's banking, needed a break. For now. Good news is that I can go back sooner than I thought...without breaking the bank. I'm all for deals, especially when they mean the opportunity to exercise at a discount, and R3 has one. Or more like three, courtesy of Gilt City Chicago. Ryde a little, ryde more and ryde a lot--all available around 50 percent off their face values. Come January I'm thinking a ride in the tropics will sound pretty good--and I can only dream about flying to Hawaii. Photo courtesy of Real Ryder Revolution. Have questions, comments, suggestions? Have gear to review or events to check out? E-mail contact@fit-ink.com. The Show Must Go On? Seen on the Run: What's Up With That? Fit-Q: What's your ideal running temperature? © 2009-2015 Fit-Ink. Simple theme. Powered by Blogger.